One of the many benefits that weighted blankets provide, comes in the form of supporting both adults or kids that suffer from anxiety or depression (which aren’t commonly that far apart). You may want to know how is it that weighted blankets became a way of mitigating the occurrence of these episodes, and if it does indeed work. 3 How are Weighted Blankets Supposed to Help with Anxiety? I have to say, I’ve never been diagnosed with anxiety or depression disorders. But I do know that most of us have gone through at least a couple episodes, and I personally had several of them when I was a teenager. Thankfully, I don’t have to struggle with those kinds of episodes anymore. And also, I’m glad to say that I won that combat way before I even knew of the existence of weighted blankets. They are more commonly referred to as NPAs (or night panic attacks), and they are a common affliction of people with anxiety disorders. These particular episodes used to trigger sheer-horror on me, to say it in a few words, but more of this ahead. Given that anxiety episodes come from the subconscious, sleeping was the only time when they could take over my mind, and avoid every last bit of logic-reasoning I had when I was awake, and made me panic while asleep about things that I couldn’t even try to describe in real life. Yeah, I know it sounds weird, but I’ll try to help you guys understand better. The anxiety used to kick-in full motion when triggered by this recurrent “nightmare” I had, and I’m not even sure that it was a nightmare, because sometimes it happened while I was starting to fall asleep, so it was more like a “feeling”. Those weren’t the regular dreams where you can identify objects or dimensions, or even yourself. No… These “nightmares” took me inside of a strange mind-state. As the dream started, I constantly used to try to understand where I was, or what I was feeling, and I couldn’t even get close to doing so, since the “place” I was, was infinite: no dimensions, no colors, nothing. And as I started understanding that there wasn’t anything to be understood there, I would constantly try to count -Yeah, “COUNT”- (I’m a man of maths, and I used to think that maybe counting numbers could help me make sense out of it). Well, it never did, and I usually found out that there was nothing to count, and it would never end, because time was also infinite in that dream, so I wasn’t going anywhere. It felt like I had to be there forever, and as my anxiety grew to a point where I felt I couldn’t manage my sanity anymore (usually short after finding out that, in the dream, I wasn’t breathing) then I would wake up. And, as usual, waking up took a while to become a relief, after several minutes of hyperventilating, sweating and trembling. No, I would recommend that experience to anyone. And yes, I know that some people go through that on a day-to-day basis. Anyway, in order to tell you a little more about his, let’s talk a little about anxiety first. Anxiety is a very serious condition, in fact, according to the Anxiety and Depression Association of America (ADAA) 18.1% of the population in the US are affected by anxiety disorders. They also state that “Nearly one-half of those diagnosed with depression are also diagnosed with an anxiety disorder”. Even if you haven’t been diagnosed with it, you must know that occasional anxiety is a normal part of a life experience, and even though the worst episodes of anxiety can be really hard to explain -especially to anyone that hasn’t gone through one of them- but I’ll try to tell you what it is about. Basically, you can imagine going through an anxiety episode as if you are constantly being chased by a psychological swarm of bees buzzing around you and not even allowing you to breathe. Anxiety makes you anticipate catastrophic results and consequences of something that “is going to happen to you”, and most of the time you won’t even be able to point out what you are actually anticipating (that makes you even more anxious) or find logical reasons to be so fearful and filled with feelings of danger from the situation. If you have suffered from that, then you know that it’s not something easy to deal with, so every little way of getting through it, and improve your mind-state so that you become less propense to them, comes indeed very well received, like this article where I share some tips I’ve found by doing a bit of research. But right now I’m going to focus in one of the ways that has been making a lot of noise for a while now: Weighted blankets. How are Weighted Blankets Supposed to Help with Anxiety? Well, first of all, I have to tell you a little about how weighted blankets work for your health, and the benefits they provide. Weighted blankets generate something on you called “emotional grounding” which basically means to attempt to make your body feel better by placing weight on it and pushing it downwards. They also provide “deep pressure touch” (DPT) another therapeutical way of calming you down by having a gentle distributed weight over your body, or a portion of it, that provides a sense of security when received. Both of these effects stimulate the production of serotonin and dopamine, which are chemical compounds (or hormones) present in the blood, serotonin helps you calm down, and feel better, it also converts into melatonin which makes you feel tired and helps you go to sleep faster, by decreasing the activity of your nervous system. All of them help overcome symptoms of anxiety, depression and stress. There are several studies on the properties that weighted blankets can have on patients with anxiety, occupational therapists in this study state that 63% of test subjects with anxiety reported lower anxiety after use, and 78% preferred the blanket as a calming modality. Weighted blankets can also reduce the levels of cortisol in your bloodstream, this is good since cortisol is the hormone that triggers your brains “fight or flight” response, which is often associated with anxiety episodes. 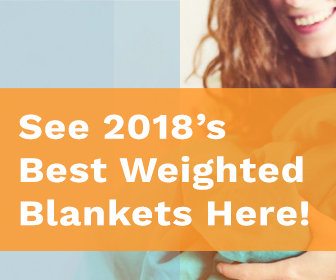 There’s no way to say for sure that weighted blankets will help you overcome anxiety or depression episodes and they can be an expensive solution. Though not that expensive when you compare it to the prices of medication. Still, if you want to give them a try, they are definitely recommended. And if you feel like you might like them, they probably will.